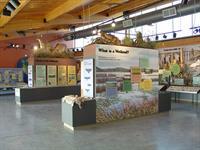 The Kansas Wetlands Education Center opened April 2009 at the southeast corner of the Cheyenne Bottoms Wildlife Area along K-156 highway and along the Wetlands and Wildlife National Scenic Byway about 10 miles northeast of Great Bend. The KWEC is operated as a branch museum of Fort Hays State University’s Werth College of Science Technology and Mathematics in cooperation with Kansas Wildlife Parks & Tourism. The 11,000 square foot building is home to the Koch Wetlands Exhibit gallery, a classroom with live animal exhibits, an auditorium, and the Wetlands Gift Store. Admission is free! Van tours, a nature trail, and many public programs also provide a glimpse of what Kansas wetlands are and what you can find in them. Cheyenne Bottoms is a 41,000 acre wetland complex that has been designated a Wetland of International Importance due to its location on the Central Flyway as a stop-over for millions of migrating birds. From Great Bend, travel 3.5 miles East on US-56 Hwy, then travel 6.5 miles northeast on K-156 Hwy to the KWEC.